Lyn Paul joined the New Seekers in 1970, part-way through the group's Summer Season in Great Yarmouth. Dana won the Eurovision Song Contest on 21st March 1970. Her winning song, All Kinds Of Everything, topped the UK singles chart for two weeks in April that year. By May 1971, when she appeared at the Empire Theatre with the New Seekers, Dana had just scored a second hit with Who Put The Lights Out (a UK number 14 in March). The New Seekers, who were about to have a Top 5 hit with Never Ending Song Of Love, were known at this time chiefly for the song What Have They Done To My Song, Ma, a minor hit in the UK in October 1970. On 29th May 1971 the New Seekers appeared at the Royal Festival Hall with Neil Diamond. Neil Diamond's trip to the UK came on the back of his first Top 10 hits - Cracklin' Rosie (a UK number 3 in December 1970) and Sweet Caroline (a UK number 8 in March of '71). A third Top 10 hit, I Am ... I Said, followed in May. "The New Seekers are not a resurrection of the old "Seekers". When Keith Potger brought them together... he had fulfilled an idea which differed completely in concept from any that the Seekers might have had. 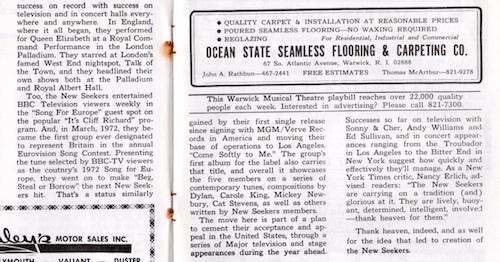 And now, 18 months, 3 Ed Sullivan Shows, 1 Andy Williams Show, and 2 U.S. smash hits later, Keith Potger says: The New Seekers do what the old Seekers did and then what the old Seekers couldn't do." The biographies of the group members were not entirely accurate: Paul Layton's year of birth was given as 1950, while Marty Kristian's and Lyn Paul's birthdays were stated to be 23rd May and 15th February respectively. In the Autumn of 1971, following the success of Never Ending Song Of Love, the New Seekers set off on a headlining tour of the UK. The group performed the following songs: We're Gonna Change The World; There's A Light; What Have They Done To My Song, Ma; Blackberry Way; The Nickel Song; Never Ending Song Of Love; Beautiful People; One; Good Old Fashioned Music; My Sweet Lord; I'll Be Home; Get Ourselves Together; Move Me Lord; Streets Of London; I'm A Train; Born Free; Georgie Girl [sic]. On 15th November the New Seekers appeared before Her Majesty The Queen at the Royal Variety Performance. Almost immediately after their appearance at the Usher Hall, Edinburgh, in the 1972 Eurovision Song Contest, the New Seekers set off on their second tour of the UK. The artwork and photos used for the tour programme mirrored the artwork and photos on the sleeve of their Eurovision single Beg, Steal Or Borrow and on their UK album We'd Like To Teach The World To Sing. The group performed the following songs: Beautiful People; Beg, Steal Or Borrow; Blackberry Way; Fire And Rain / My Sweet Lord; Georgie Girl [sic]; Good Old Fashioned Music; 'Hair' Medley; I Believe In Music; I'd Like To Teach The World To Sing; I'm A Train; Look What They've Done To My Song, Ma; Never Ending Song Of Love; Nickel Song; One; Tonight; When There's No Love Left. The New Seekers' performance at the Royal Albert Hall on 12th April was recorded and issued in the UK as a double album, Live At The Royal Albert Hall. It was also filmed for television and released many years later on video and DVD. 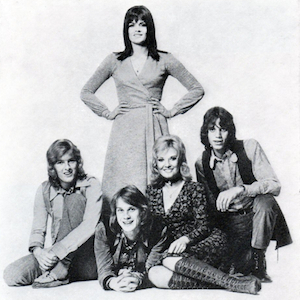 As 1972 drew to a close the New Seekers squeezed in a concert tour of New Zealand and Australia. The Winter '72 - '73 Fan Club Newsletter reported that the tour had been a "great success", with the group playing to "the second biggest audience ever known in Aukland." For Peter Doyle and Marty Kristian the tour gave them a welcome opportunity to visit home: "Of course Peter and Marty were happy to have another chance to meet their relations and friends in Australia, even though they were only there for a few days." The tour programme described Lyn Paul as "a singer, dancer and comedienne" and mentioned her past association with Eve Graham in The Nocturnes: "Lyn was with her own vocal trio initially before joining Eve in The Nocturnes. Both girls then left the group to sing in The New Seekers." The New Seekers' third UK tour was compered by DJ Alan Freeman, the Pick of the Pops presenter known for his catchphrases "Greetings, pop pickers" and "not 'arf". The group was supported at some venues by the duo Ofarim and Winter. Abi Ofarim (real name Abraham Reichstadt) was best-known for his 1968 hit Cinderella Rockefella, recorded with his wife Esther. Tom Winter had previously been a member of the Dutch band Opus. From the beginning of June 1973 through to the end of August that year the New Seekers made a variety of live appearances across the USA. These included a series of shows supporting Vikki Carr. Best known in the USA for her 1967 hit It Must Be Him, Vikki Carr had first made a ripple on the pond in 1962 with her recording of He's A Rebel. The song caught the ear of producer Phil Spector, who promptly recorded the cover version that became a number one hit for The Crystals. Carr had to wait five years before she had her own Top 3 hit but then went on to have a string of, albeit more minor, US hits with songs such as The Lesson and With Pen In Hand, the latter written by Bobby Goldsboro. Her last hit, 1971's I'll Be Home, was a Randy Newman song which the New Seekers had also recorded that year. I'll Be Home was featured on Carr's 1971 album Vikki Carr's Love Story, which also included her version of Hurt, a song that Lyn Paul would later record on her album Late Night. In 1973, in addition to her concert performances, Vikki Carr guest-hosted The Tonight Show Starring Johnny Carson. 5th May, Rainbow Theatre, London.